Some poor 13-year-old kid is all over the news as having made a "solar breakthrough". The news is to blame. All the usual suspects -- popular environment blogs, tech magazines -- blindly parrot the words of this very misinformed (not to blame him, he's an unguided 13 year old) kid. This is, I'm sad to say, clear nonsense. I'll take this in two parts: one, why his experiment is, unfortunately, completely broken (sorry again). Two, why the imagined result is impossible nonsense. Most importantly, by mistake he did not measure power outputs from the solar cells. Instead he measured voltage, without a load attached ("open circuit"). They are barely related -- in solar cells, voltage is actually almost a constant, independent of power. 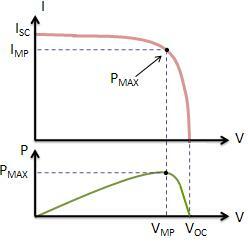 VOC denotes the "open circuit" voltage: when there is no load attached, and no current flows (I = 0). Power goes as V*I; a real solar system will maximize efficiency, by working at the point on the I-V curve which maximies power (PMAX). The kid is measuring VOC. As it happens, this is practically independent of power output! Here's how the I-V curve changes with incident solar power ("irradiance", areal density of radiation in [W/m2]). As this solar module datasheet shows, VOC is almost a constant, regardless of incident light! In this module, VOC stays close to 35 V, over a 5-fold range in irradiance. Whether the incident light is bright or dim, the open-circuit voltage is the same. End result: measuring the solar cells' VOC over time, and adding them up, is garbage data, and has nothing to do with energy production. As for why the result is impossible. I'm not sure I understand the confusion by which people think there could be some advantage, to orienting panels at sub-optimal angles. That somehow combining sub-optimal panels, together, makes them generate more energy in the net. Here's my argument, in case it helps clear up misconceptions. Take an collection of solar panels (indexed by 'i'). Their power output is the some of their individual outputs. So, their total energy output (power integrated over time) is also the sum of their total energy outputs. So: if the individual angles in the "tree" are worse then the 45°-tilted south-facing panels in the flat array (they obviously are), so is their combination. (Implicit assumption: that the panels are non-interacting, e.g. they do not obstruct (shade) each other, or heat each other, etc. The panels in the "tree" do actually shade themselves, which makes them strictly worse and does not change this result). Whether or not his idea optimizes solar panel output, the fibonacci sequence is not mystical at all. Leaves on a plant DO optimize their exposure to sunlight by the arrangement in a spiral along the stem that correlates with the sequence 3,5,8,13,21, etc.The spiral DOES allow each leaf to receive light. Perhaps the young man's experiment failed, but there may still be a way to utilize the arrangement. Remember they said man would never fly, etc. etc. etc.